Today’s guest post is looking at how our sofa’s and the view from them, tells a lot about us. What sort of view do you have from your sofa? What can you see when you sit down on the couch? The chances are that there is a TV in front of you. It is estimated that over 90 per cent of front rooms in the UK have a TV in front of the sofa. It makes sense if you think about it. If you are going to watch the box, you might as well be comfortable and it doesn’t get much more comfortable than a sofa. Curl up, pull a blanket up around you and settle in for the night. The only hard part is trying to find something to watch on the fifty plus channels you have at your disposal. What else can most of us see from our sofas? It wouldn’t really be a front room or living room if it didn’t have a window. Natural light and a view onto the outside world is essential. Unless you’re lucky enough to have a room which is a home cinema, you should really have a window out of which you can stare and watch the world go by from the comfort of your couch. The view you get from your window will, of course, depend on where you live, it could be beautiful countryside or an urban cityscape, the view from the sofa is always different. You can tell a lot about a person from their sofa and the things you can see from it. If you were to sit on someone else’s sofa, just by judging the things they have around them (we tend to keep the things most important to us close by) you can create a picture of the owner. So, if the walls are lined with books, then you know reading and the search for knowledge is important. 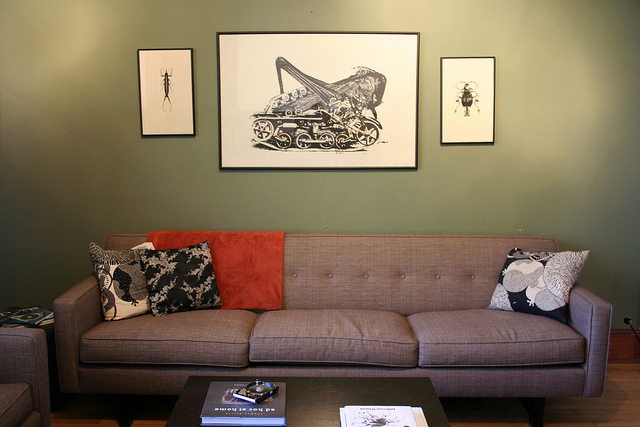 If the walls are covered in fine art or prints, the sofa’s owner has a passion for the artistic. Some consoles will point to a technological bent and passion for gaming and the competitive. Of course, that also means you can create your sofa and living space to reflect your passions. Spruce up by picking up some cushions, luxurious dining sets or reposition the furniture to create a better Feng shui and dress the area with things that make you happy. Since we spend so much time taking in the view from the sofa, we should try to make it a pleasant one. This is a guest post from Sainsbury’s. If you’re looking to get a new perspective on life and update your living room then take a look at their fantastic selection of sofas online today. I keep my little £2 table next to me that I bought for Grandad , dad inherited and which then went to mum and finally to me and its got all sorts of its in and on that mater to me. So true! Hmmmm. Food for thought here. I was wondering about some strategic decluttering. Perhaps if I could see less clutter from my seat on the sofa, then I would feel more positive about the house overall!